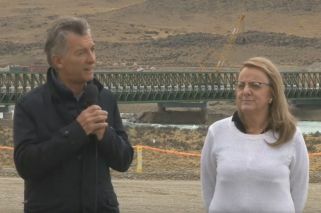 President Macri meets Alicia Kirchner at rare public event in southern Santa Cruz province. President Mauricio Macri made his first visit to Santa Cruz province on Monday where he surprised many by appearing alongside Governor Alicia Kirchner. Images of Macri and Kirchner were news in and of themselves in Argentina throughout Monday since the sister of former president Néstor Kirchner is a staunch opponent of the Macri administration. The pair presented the Cóndor Cliff and La Barrancosa hydroelectric dams. “Thank you to the Governor for the welcome. These dams represent a lot for Santa Cruz and it is a relief for everybody that they are finally advancing (as public works projects). I agree with you (Governor Kirchner) that energy production is fundamental. Without energy, we cannot develop anything,” Macri declared. He described the projects as “a before and after for the Patagonia”. “It highlights what we’ve been doing since day one: building the bases of development for all Argentines. We came to transform Argentina from the ground up and forever”, Macri added. In a sign of “reconciliation” with Alicia Kirchner, the head of state indicated that he “agreed with the Governor that during an election one visits and presents his proposals but the day after (the election) we must all be working in the same direction, prioritising employment and inclusion opportunities”. The president arrived to the El Calafate Airport at 12.25 Monday where he was welcomed by Vice-governor Pablo Gonzaléz and El Calafate mayor Javier Belloni. Moments later, he jumped on a helicopter to the Cóndor Cliff dam, 130 kilometres away, where Governor Kirchner was waiting for him. They were joined there by a group of executives from the Gezhouba Group Corporation, a Chinese firm which is working with local company Electroingeniería e Hidrocuyo SA. It was not only Macri’s first visit to Santa Cruz as president. He also avoided the Kirchner family's political heartland as a candidate and president-elect. Prior to his arrival in El Calafate, Macri met local beef and sheep producers alongside Agribusiness Minister Luis Miguel Etchevehere, Presidential Secretary Fernando de Andreis and the head of Santa Cruz’s Agricultural Institutions Federation, Michael O’Byrne. The next stop on his official tour of the Patagonia region is Puerto Madryn in Chubut province. From there, Macri will travel directly to Brasilia for his first meeting with President Jair Bolsonaro.